Incheon – Last year, a total of 313 humanitarian workers were attacked in the field, according to the UN Aid Workers Security Report. To enhance aid workers’ awareness of their personal security and safety, IOM, the UN Migration Agency, offers a training programme on how to respond to various security challenges for people deployed to hostile environments. Safe and Secure Approaches in the Field Environments (SSAFE) has become a UN-certified flagship security training for aid workers from government agencies, international organizations, NGOs and private sector organizations. IOM in the Republic of Korea (ROK) and the ROK International Peace Supporting Standby Force (IPSSF), a Korean armed forces unit which provides training for peace keeping missions, jointly organized a SSAFE training in Incheon, ROK last week (16-19/10). The training, which was funded by USAID’s Office of Foreign Disaster Assistance (OFDA), was attended by 23 participants from UN agencies including the World Food Programme and Special Tribunal for Lebanon; NGOs World Vision and ChildFund; and private sector companies IBM Korea and the Hankyoreh Media Group. “As field operations have become more complex and unpredictable, demand for capacity building workshops (of this kind) has been growing among humanitarians. This four-day training was an excellent opportunity to understand threats to my security and (counter) measures that I can apply in the field. 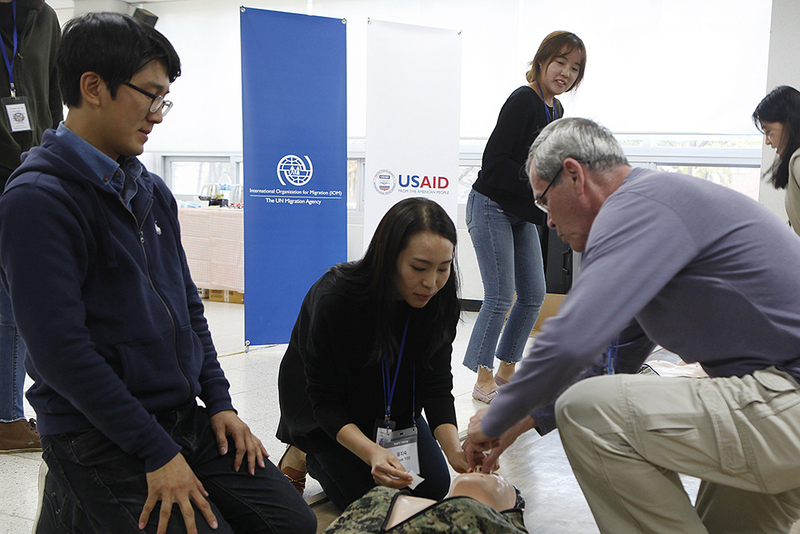 I hope more Korean aid workers can learn these essential skills to stay safe,” said a participant employed by a Korean NGO. Facilitated by IOM’s Staff Security Unit, the training included lectures and field exercises designed to equip participants with personal security awareness, first aid and radio communication skills. It also provided two days of scenario-based exercises, including hostage survival and checkpoint simulations. IOM Senior Security Operations Officer Steve Mayall, who led the programme, noted the enthusiasm of participants to learn about how to protect themselves from unexpected dangers. “Everyone fully grasps the notion that a better understanding of the potential hazards will mitigate the risks that they will encounter during their deployments in the field,” he said. IOM ROK has been hosting safety and security trainings to Korean humanitarian workers since 2015.